This centre is situated next to the lively Josefstädterstrasse, close to many major banks, shops and other service providers. This centre offers fully serviced offices in a prestigious venue. A range of amenities is available for clients and local transport links are excellent, with a number of bus and rail services operating frequently throughout the immediate area and the further reaches of the city. An ultra-modern centre with spectacular architecture and top quality facilities including a relaxing courtyard area; a restaurant, numerous major banking outlets, a bespoke bakery and secure on-site parking. The property offers exemplary technological servicing and highly equipped specialist facilities and is in a popular international business park south-west of central Vienna with good transport links. This professional and exquisitely furnished business centre is situated within one of the most commercially friendly cities in all of Europe. The centre accommodates up to eight people and provides cost-effective business solutions to corporate tenants in search of affordable, high quality and trouble-free co-working solutions all set within one of the most desirable and highly sought-after corporate districts anywhere in Austria. Excel in offices well situated in a lively complex, a stone's throw away from the very centre of charming Vienna. This attractive, fully furnished centre is well connected and fully equipped to help your company increase productivity. On-site admin support handles your photocopying, mail, phone calls and visitors for your convenience. The business centre is situated close to many local services, including restaurants, cafes, bars and stores. You can also have unlimited access to all our business lounges worldwide! Conveniently located in the flourishing development of Viertel Zwei business park, this business centre offers cutting edge coworking spaces, collaborative meeting rooms as well as training and interview rooms. Generously spaced and fully furnished, you can benefit from its services with peace of mind as its comfortable facilities come under its all inclusive price. It is surrounded by regularly serviced transport links as well as secure parking facilities, so getting to and from this premium centre is easy. Close to the city centre and the main sites and attractions of the region, this modern landmark building is the tallest building in Austria and as such provides a prestigious home for any business client. The on-site facilities are both state of the art and of the very highest corporate standard, meaning that day-to-day operations are easily facilitated. The area offers excellent transport links with convenient connections and services running frequently via road and rail, as well as boasting a number of very popular amenities and commercial services to provide everything one could need in close proximity to the building. These premium, stunningly furnished and stylish office suites boast large, expansive windows with picturesque views, providing idyllic scenery and an abundance of natural light to the centre's interior workspaces. Set within a magnificent and regionally key former railway station, this building and its wider infrastructure have recently been modernised and developed to provide a contemporary environment, refurbished and renovated to the highest standard and fitted with state of the art facilities. The area also offers superb transport links which make the centre easily accessible for both clients and visitors. This contemporary and exquisitely furnished business centre is very easy to reach from the A23 and A4, with plenty of secure on-site parking close-by. Set in the heart of Vienna, this flagship office centre is located on two floors of this impressive and modern office building. Offering a range of support services to suit any corporate needs or requirements, the on-site provision and range of specialist managed services is second to none at this premium and impressive location. Situated in a modern, mixed-use tower block next to the lively Floridsdorfer Hauptstraße, this business centre provides flexible office space and an in-house conference centre. The perfect space for both start-ups and long established businesses. Excellent transport links in and around the area operate frequently, and there are a number of shops and restaurants within walking distance of the site. 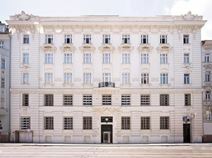 This is a unique opportunity for renting contemporary designed office spaces within a charming historic building in the heart of Vienna. Furnished to a high standard and decorated with great attention to detail, these offices are available in an array of sizes, provided with lounge areas, meeting and conference rooms, and the latest telecommunication solutions. Centrally located, the building enjoys a stunning view over the surrounding area and is close to local amenities, such as shops, restaurants, leisure facilities and a variety of entertainment. These office solutions are located within walking distance of the underground station and are well served by a selection of public trasport. Located in the heart of Vienna, right beside the Hauptbahnhof, this business space is found in a brilliant neighbourhood. You will have access to a range of amenities including eateries, shopping facilities and supermarkets. Offices are open plan, with plenty of natural sun light and sleek finish. You can choose between a private offices or coworking desks, with access to meeting rooms. The building also offers dining areas and kitchenettes for your convenience. Offering premium office solutions in the heart of Vienna, this business centre offers private offices, co-working solutions and virtual office options. The business centre has a thriving and dynamic community of international members, including entrepreneurs, creatives and freelancers. You can easily book and hire meeting rooms. Work stations are fully furnished and well equipped, with high speed internet connectivity, printing facilities and 24 hour access. These bright, airy and contemporary office suites are available within this superb, central business centre, ideal both for individuals and major international companies of any industry or corporate background. Full servicing is available and the centre is close to St Stephen's cathedral and excellent local transport links, including convenient road and underground rail networks within close proximity to the building itself. This professional business centre is a modern and fully equipped business site, complete with high quality furnishings and professional office facilities including copy and printing equipment, conference resources and lounge space for corporate tenants. The office suites provided here are available on flexible terms and at excellent value. The surrounding area features a wide range of shops, retail outlets and services; as well as excellent local transport links. This executive business centre offers exceptional quality office suites in a key central location and premium office building in the heart of Vienna's main corporate district and major commercial hub. The centre is a fully furnished and exquisitely fitted corporate site, providing a wide range of premium equipment and technical facilities to enhance the working productivity of all occupying clients. Local transport links are also very good, connecting the building with the surrounding areas of the city and making the centre highly accessible to all visitors and corporate tenants. This stylish and unique office space is located on the 2nd floor of the iconic Palais Herberstein in Vienna. It offers a superior and stylish business environment in the centre of Austria's vibrant and illustrious capital. The centre offers a wide range of exceptional facilities and its interior workspaces benefit tremendously from the abundance of natural light provided by the large glass windows. These professional and superbly located offices in an exciting modern building come with inclusive conference facilities, 24 hour access and car parking provided as standard. The interiors benefit from an abundance of natural light and the property is central to the city's business district, right next to the shopping area of Kaertner Strasse, close to the Vienna State Opera as well as subway and tram links. Located right in the city centre of Vienna, this brand new business centre opening soon will offer contemporary office solutions. Workspaces include collaborative co-working spaces, private offices, hot desking options and virtual office options. Meeting rooms can be easily booked with the use of an app. All of these workspaces benefit from 24/7 access, allowing you to work flexibly, and plenty of natural light to promote productivity. Everything is fully furnished and ready to use, with options to customise your space to suit your needs and your taste. You can scale up or down, as required by your business growth. The surrounding area offers plenty of amenities including high end shopping, trendy bars and restaurants. This business centre offers modern office suites with meeting facilities and secretarial support provided to tenants on site and on a daily basis. This centre also offers impressive IT systems and on-site car parking and is a short distance from central Vienna, near to motorway links and public transport and within easy reach of shops and cafés. The centre itself is ideal for any type of professional client due to its close proximity to an extensive variety of local amenities, in addition to its included on-site facilities and exquisite furnishings. This modern and professional business centre provides well presented offices and conference rooms in a spacious, contemporary building with full servicing and ample parking provision on site for all tenants and corporate visitors. 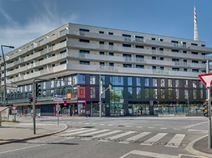 The centre and wider building is situated within a prominent location near the Westbahnhof railway station. Occupants and visitors can benefit from fantastic motorway links, a Schwechat-Vienna Airport is an easy distance away, making hosting international meetings and corporal events as easy as possible. This modern office centre offers a wide and extensive range of fully serviced and equipped office space, meeting rooms, and lounge areas in a modern design. Located on the widely know Mariahilfer Straße, the centre is surrounded by a variety of restaurants, shops and bars. It is situated above the underground railways U3, within close walking distance to U2, and the centre also offers nearby car parking. Large, spacious office suites and fantastic facilities are available within this sharp, modern centre which can be let in a variety of configurations, either furnished or unfurnished. It is ideal for individuals or small companies and many offices have great views of the city and the nearby vineyards. The site is to the north-west of the city centre, with excellent transport connections to the city and the airport. This brand new, contemporary business centre consists of premium office spaces of various size, spacious meeting rooms and an elegant lounge area and roof terrace. These office spaces are provided with high speed internet connection, administrative and security services and facilities including private parking spaces. Conveniently located in the centre of Vienna's art district, this business centre is surrounded by an extensive selection of restaurants, theatres, museums, and shops. It is also served by a number underground and tram lines. With a diverse and extensive variety of superb fittings and furnishings, professional support services and free tea and coffee; workstations in this modern shared office centre are now available on flexible terms. This is an excellent location in the heart of the city, with good and convenient transport links in addition to a range of retail and eateries throughout the nearby districts and wider region. Housed within the extraordinary former Stock Exchange building, this modern and unrivalled business centre is set in a highly desirable office building complex and offers a huge range of service, including an in-house internet café, superb IT and conferencing equipment and notable office interiors. Convenient and frequent transport connections including rail, tram and subway links are a short distance away and easily accessible by foot. Ideal for a company looking to cultivate success in a modern and accommodating setting. This perfectly situated centre stands in the centre of charming Vienna, and provides accommodating business amenities for forward-thinking companies who value convenience and efficiency. With 24-hour access to the centre, you will also benefit from cleaning services, high-speed broadband and Wi-Fi, and the provision of refreshments at a flat-rate. The offices are surrounded by an excellent selection of restaurants, museums and cafes, with excellent transport links to take you in and around the city. A variety of small, flexible office suites are available in this contemporary business centre are available and can be let either furnished or unfurnished, offering significant flexibility and freedom to prospective clients. Many impressive offices offer sweeping views of the city. Virtual Office packages are also on offer, providing not only a prestigious business address but also a range of services including telephone answering and redirection, postal services and meeting space availability and entitlement. Located about 10 minutes away from central Vienna, the area has exceptional motorway links with immediate access to bus and tram routes. This modern, all inclusive centre offers superior admin support to help your business operate efficiently. The space offers number of attractive rentable training and seminar rooms for collaborative success. The premise is accessible 24/7, and is perfect for individuals, small or medium organisations alike; showcasing its convenience. Located opposite the Erdberg underground station, with car parking facilities, making travelling to and from work as painless as possible. Situated in the middle of the new pedestrian zone in the heart of Vienna, this business centre has been designed by renowned interior designer, Eric Kuster Metropolitan Luxury and provides uniquely designed office space with a highly innovative layout. Perfect for requirements of all sizes; this centre offers fantastic interior workspaces, excellent transport links and ideal local services and amenities. With immediate access to all the amenities of its airport location this centre is a convenient address for international business clients and operations. The building itself is a state of the art steel and glass construction with bright interiors and excellent views of the airport's runways and the surrounding area. It has a stylish business lounge, breakout space and professional reception. It is minutes from hotels, gym, shops and restaurants, whilst being an easy distance from central Vienna by express train. An furnished office space, in an exceptionally convenient area, right at the heart of Venice. This flexible workspace is available on an all-inclusive plan, with essential business amenities at every workstation. There is also a meeting room, perfect for collaborative meetings. It is perfectly situated for easy commutes, being just 5 minutes away from Stephansplatz underground station. There is an excellent selection of restaurants and cafes around the centre, offering hardworking companies and clients a perfect opportunity to transition from business to leisure. Comprehensive business facilities are available within the stunning architecture of the Twin Towers which is suitable for small and medium sized companies. Luxurious furnishings are installed throughout the centre which offers full disabled access, an in-house internet café, a lounge and underground parking. The centre can be found in the Wienerberg Business Park, south of the city centre. It has good transport links, with an excellent selection of leisure services in the surrounding area.